Discover the best Ruin Bars in the Hungarian capital! Real institutions of Budapest, the Ruins Bars appeared in the 2000s, all located in the center of Pest. 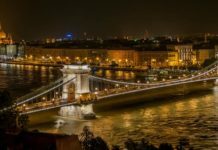 Now they are the essential entertainment spots of Budapest nightlife. They are found in abandoned buildings, often in inner courtyards and over several floors. Each Ruin Bar has its own unique style and musical ambience. Some are decorated with old objects of the 70s, while others are more ‘arty’, but all will impress you with their architecture and atmosphere! You can have a drink and in some attend a concert or movie and dance to different musical styles. The vast majority of the Ruin Bars of Budapest are in the same district as the city center, the Jewish quarter in the 7th district. So you can easily discover them one after the other on foot. In the evening from Thursday to Saturday, be patient because entrance, usually free, may require a long wait after 21:00. Szimpla Kert was the first Ruin Bar in Budapest, opened in 2002 in a historic building formerly occupied by apartments and a factory. 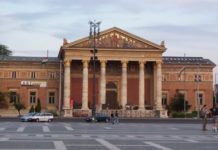 This is an iconic Hungarian night spot where you can experience a unique underground atmosphere, concerts and outdoor film screenings. It is well worth it to take the time to discover each room, one more surprising than another. There is no dance floor but the huge big yard quickly becomes electric after 23:00. 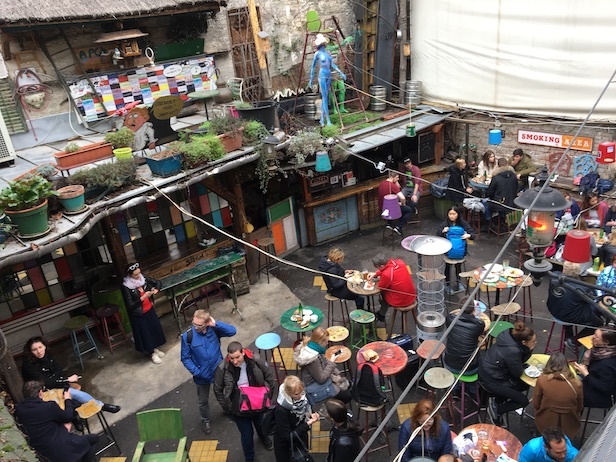 The Szimpla Kert can be visited quietly during the day as it hosts a farmer’s market every Sunday from 09:00 to 14:00 (video on this link). Address: Kazinczy u. 14, VIIth district, Pest – plan – website. Open hours: from 12:00 to 04:00 from Monday to Thursday, Friday from 10:00 to 04:00, Saturday from 12:00 to 04:00, Sunday from 09:00 to 05:00. Admission is free. Instant and Fogas, two of Budapest’s legendary Ruin Bars are now in the same space on Akácfa Street. 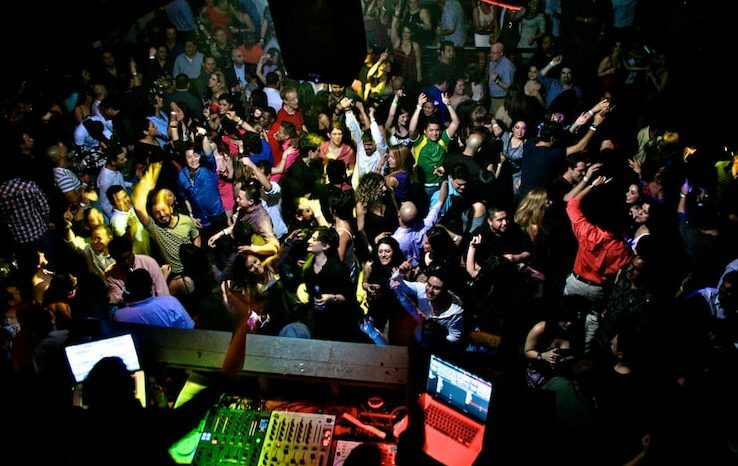 Discover the biggest complex of the city with 15 bars and 8 dance floors over several floors and the basement! Starting on Thursday evening, you will be greeted with an exciting atmosphere (so plan to be in a long line from 23:00). Address: Akácfa utca 49-51, VIIth district, Pest – plan – website. Open hours: every day from 16h00 to 06h00. Free admission. The Gozsdu Court is not itself a Ruin Bar, but it is located right in the center of the Jewish Quarter, surrounded by Ruin Bars. It is a must for your evening! 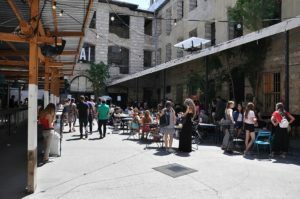 In a long courtyard are linked restaurants, cafes, bars and clubs animated throughout the year by concerts and exhibitions. The DiVino Wine Bar and the Spiller Bar Restaurant are our favorites, as is Jamie’s Pizzeria’s Italian restaurant, owned by the famed English chef, Jamie Oliver. From Friday to Sunday between 10:00 and 17:00, the complex hosts a small market with stalls crafts and antiques. Open hours: non stop pedestrian crossing. Free admission. The Anker’t Ruin Bar near the State Opera and Andrássy avenue is housed in an imposing building once occupied by a factory. Its unique space is characterized by a raw, minimalist design with several bars and courtyards together with a dance floor. 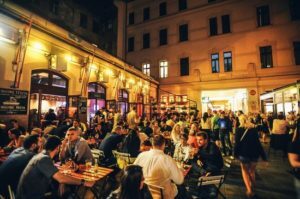 The older hipster atmosphere is favored by regulars of the foreign community living in Budapest. Address: Paulay Ede u. 33, 6th district, Pest –plan – FB site. Open hours: every day from 15:00 to 04:00. Free admission. Budapest Nightlife – Ötkert ruin bar club. If you want to dance all night, the Ötkert is the place. 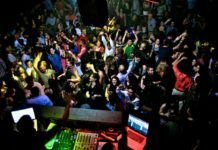 It is a club and restaurant located between St. Stephen’s Basilica and the Danube, in a different neighborhood from other Ruin Bars. Many concerts take place here (programming is on their website). Address: Zrínyi u. 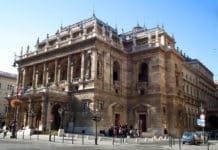 4, 5th arrondissement, Pest – plan – website. Open hours: daily from 11 am to midnight. Wednesday-saturday: 11 am to 5 am. Hello Baby, located on the prestigious Andrassy Avenue, just steps from the Oktogon Square, opens its doors only on Fridays and Saturdays. 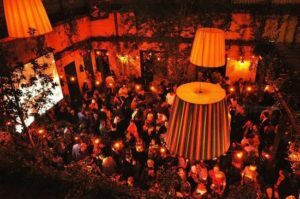 In an immense interior courtyard animated by luminous projections, two dance floors and several bars await night clubbers. The atmosphere is closer to a nightclub than not a Ruin Bar where you go to have a drink. Before midnight, the place may seem deserted, but it does fill up afterward. Address: Andrássy út 52, 6th district, Pest – map – website. Open hours: Friday and Saturday only from 22:00 to 05:00. Located in Pest at the foot of the Chain Bridge on the edge of the Danube, the Pontoon Bar is a magical place where you can enjoy outdoor views of amazing Buda, while you drink, eat and enjoy live concerts. Admission is free. It is open from noon to 4 am every day (closed from October until Spring). 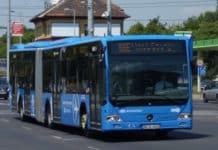 Address: Antall József rakpart 1, 5th district – plan – site FB. 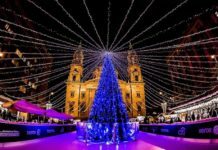 The Akvárium club in the city center of Pest welcomes you with its huge terrace and steps on Erzsébet Square and its Park. It is an iconic place to meet at night. 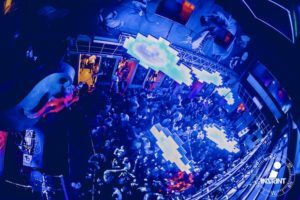 The club is a real cultural center that hosts exhibitions and concerts, with music appealing to the mainstream and underground. Open from 12:00 every day. Address: Erzsébet tér 12., 5th district – plan – website. Also discover our selection of Budapest restaurants on this link, of Best rooftops on this link and our article about the best baths in Budapest on this link to get back in shape after your evening out!